Extreme gloss fiberglass and gel-coat protection! Blended polymers resist salt water and UV light. Deters algae and crustacean formation on boat hull. 3M Marine Ultra Performance Paste Wax provides high gloss protection to fiberglass/gel coat boats. 3M polymer technology provides the durability of an acrylic with the soil release and water beading properties of fluoropolymer and silicone. Use 3M Marine Ultra Performance Paste Wax to keep your boat looking sharp and sea-worthy. This is because 3M Marine Ultra Performance Paste Wax is designed specifically for the inhospitable marine environment. The wax actively bonds with the surface to seal out algae, water, UV rays, and contaminants. 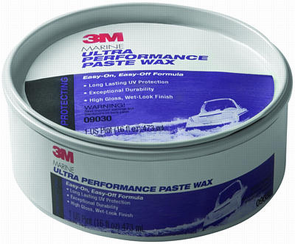 3M Marine Ultra Performance Paste Wax provides a high gloss, wet-looking shine that lasts and lasts.